There is a basic workflow in deploying DAC. The key component of DAC is a central access policy. 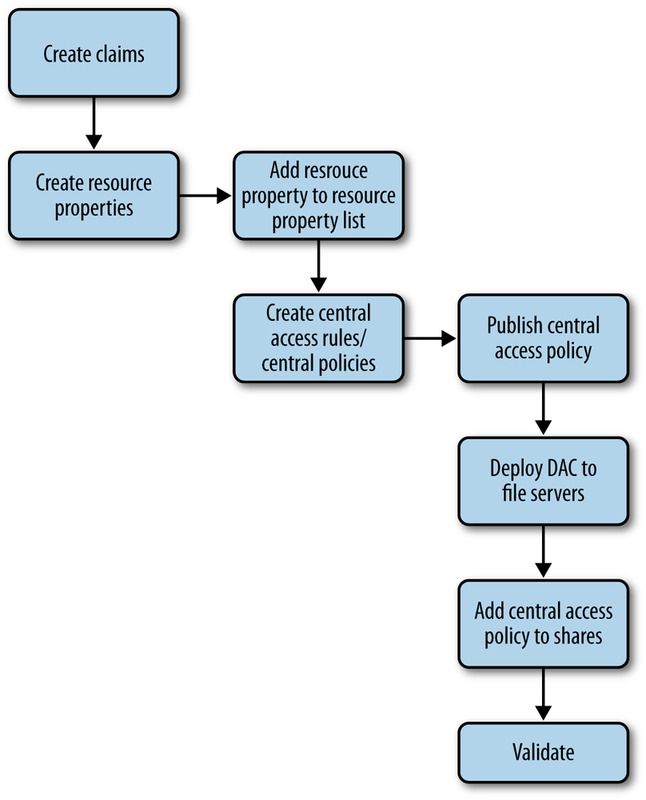 The workflow for creating a central access policy begins with configuring claims; as mentioned previously, these are properties used to compare user accounts and files to determine if a user has the requirements needed to access a file. These properties, or claims, are added to a resource property list. The next steps involve the actual creation of the central access policy. The resource property list is applied to this policy. The policy is then published throughout the domain. We can then deploy DAC to file servers, and the central access policy is pushed out to folder shares. The last step is to validate DAC. The process is summed up in the chart in Figure 1. When configuring claim types for users, you are adding existing Active Directory attributes to the list of attributes used to evaluate who gets access to what. In this example deployment, we’ll use the Payroll user department as part of the calculation to determine whether a user has access to files in the Payroll folder share. From Server Manager, open Tools and then Active Directory Administrative Center, and click Dynamic Access Control. Click Claim Type→New→Claim Type. Under Source Attribute in the resulting window, scroll to look for Department; then, click that attribute and make Value Type equal String. Here, we are basing the existing Department attribute on the new claim type we will create. In the Active Directory Administrative Center, you will now see a new claim type. In Figure 2, you can see the option “Protect from accidental deletion.” This protection is enabled by default for objects created in DAC. If you want to delete an object, you must uncheck this option.